There’s a lot to love about fall weddings. From jewel-toned color pallets and autumn-inspired bouquets to long-sleeved lace gowns and plaid accents, fall weddings are as chic as ever. We may be a little bias here at Scarborough Fare Catering, but we’d have to say our favorite part of these autumn affairs is the food! This season brings with it a wealth of fresh ingredients and unique menu options for the food-fanatical bride and groom. Since there is a chill in the air, guests will be craving rich, intensely flavored meals, allowing chefs, event planners and couples alike to think beyond the salad-and-meat entrée combo. Here are a few of our favorite ways to get creative with catering in the fall. Passed hors d’oeuvres, finger foods and bite-sized items are becoming more and more impressive in the world of wedding catering. We suggest a combination of sweet and savory ingredients to give your guests the perfect taste of what’s to come. Some of our favorite, yummy fall-themed appetizers include Brown Sugar Glazed Country Ham & Sweet Potato Biscuits and Goat Cheese Stuffed Figs. Folks also love our Cornmeal Crusted Fried Oysters year around, but especially during the cooler months. After your beautiful ceremony we know guests will have warm hearts, but how about warm bellies? Fall is the perfect time to move away from the traditional salad as a first course and opt for a soup, its warmth and heartiness makes for a natural fit. Soup shooters are a unique way to incorporate this into your wedding menu. These soup shooter are butler passed and can be paired with our gourmet Grilled Cheese Panini with Chapel Hill Creamery Hickory Grove Cheese. 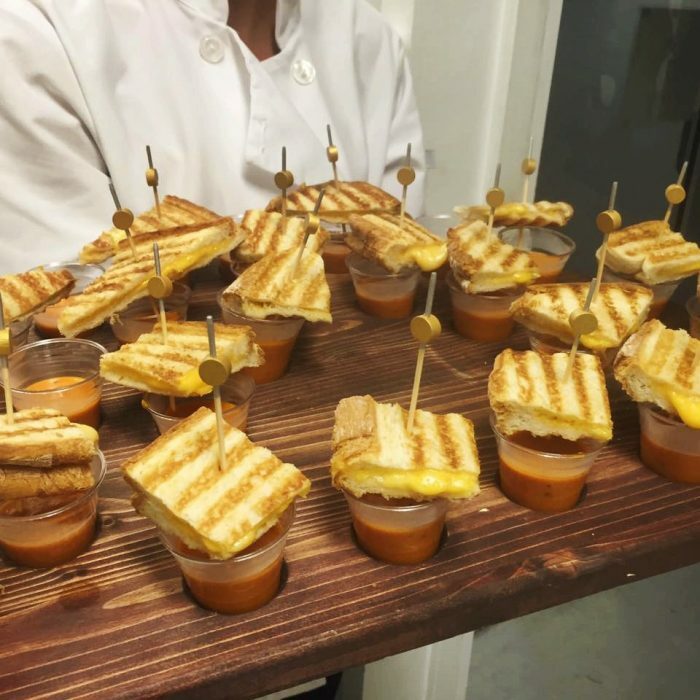 Soup shooters paired with our gourmet Grilled Cheese Panini with Chapel Hill Creamery Hickory Grove Cheese. But, there is nothing wrong with sticking to the traditional salad starter. After all, it is a crowd favorite! Try adding hearty, seasonal elements to your greens. We have salads featuring fall-inspired toppings like pecan crunch, honey crisp apples, goat cheese, grilled figs, salt roasted beets, golden raisins, Asher blue, and maple cider vinaigrette. When we think of fall food, ingredients like apples, squash, herbs and potatoes tend to come to mind. Consider a heartier protein featuring the flavors of fall, like our Catalan Lamb Chops served with apricots and sage, seasoned with vermouth, tomatoes and cinnamon. Our other favorites include Stuffed Pork Tenderloin with Bacon & Apple Riesling Sauce and Fig & Balsamic Glazed Quail or Cornish Game Hens. Or add a unique flare with a martini glass station featuring Guinness Braised Short Ribs over creamy stone ground yellow grits with herb gremolata and crispy okra. To complete your fall feast pair with Spiced Roasted Root Vegetables with Feta & Pomegranate Arils. 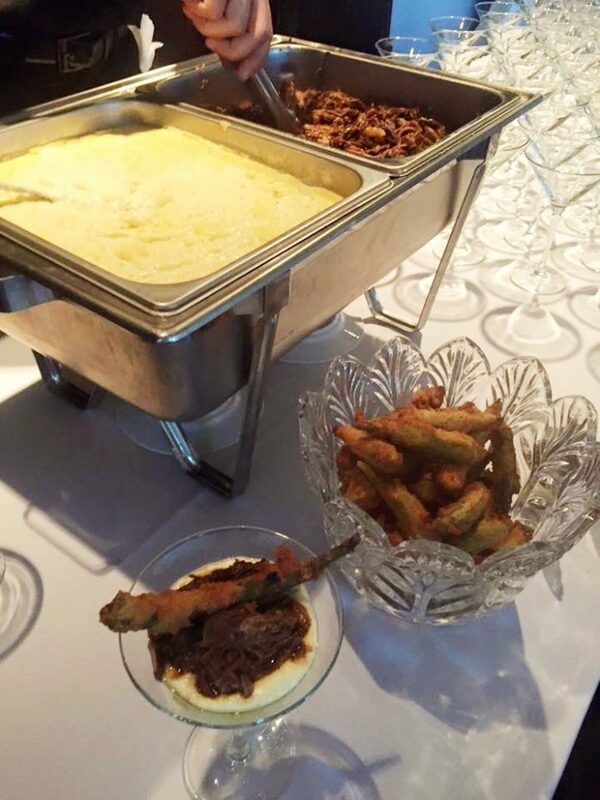 Martini Glass Station featuring Guinness Braised Short Ribs over creamy stone ground yellow grits with herb gremolata & crispy okra. Now to the sweet stuff! It’s no secret that brides and grooms are adding alternative desserts alongside the traditional wedding cake. We have to say, we’re really loving this trend. The best way to incorporate fall flavors such as pumpkin, cinnamon, apple, caramel and spices in your wedding desserts is by having a dessert bar with an assortment of goodies. Consider the fall classics like pies and cobblers. Our Pecan Bourbon Pie, Crunchy Caramel Apple Pie, Sweet Potato Meringue Pie, and Bourbon Peach Crumb Cobbler are all crowd-pleasing choices. It’s time to raise your glasses to the new Mr. and Mrs.! No fall wedding menu is complete without a few drink options. Regardless of whether or not you choose to serve alcohol on your big day, there are plenty of ways to embrace the season in your wedding bar menu. Mulled wine is a tasty alternative to regular wine, seasonal beers with pumpkin or maple flavors are a nice addition for beer lovers and warm apple cider or wassail are great in both alcoholic and non-alcoholic forms. Another great alcoholic option, perfect for the season, is the Apple Butter Bourbon Brew. The perfect finishing touches are what will set your fall wedding over the top. 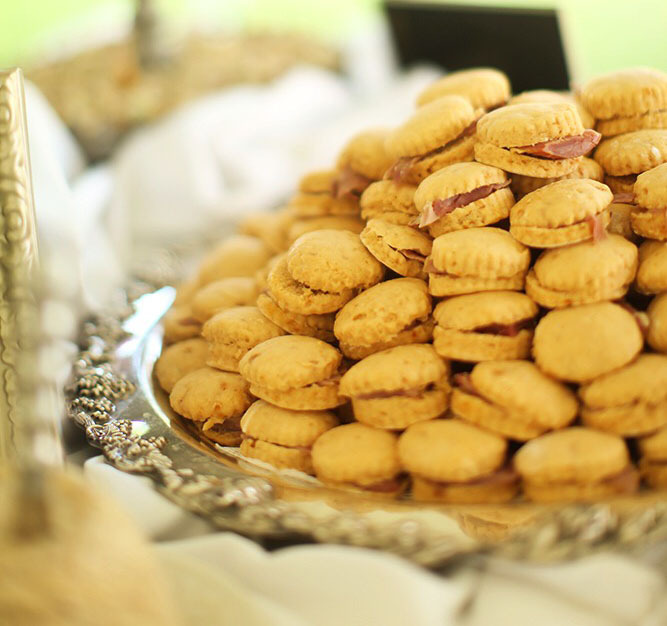 Not only will Scarborough Fare Catering in Greenville, NC work with you to create the perfect matrimony menu, we also work with couples on other needs to complete the reception. You won’t have to worry about working with multiple vendors for your reception, because we will cover the tables, chairs, linens, china, glassware and even tents. Are you inspired by the season? Serving all of eastern North Carolina, Scarborough Fare Catering is here to make your special day delicious. Contact us today!